I'm a bit belatedly announcing that famous-views 0.x (for famous v0.3.5) is deprecated. Work continues on the 1.x branch for famous 0.5+, aka "mixed mode" (you can read more about that release in the update). You can happily continue using famous-views 0.x and famous v0.3.5 in your existing projects. However, that famous API has been discontinued too. Once a famous-views 1.x stable is released, you should try upgrade projects that are still being actively maintained. For new projects right now, depending on their deadline, you may consider using a preview release of the new branch. Note, the mixed mode ecosystem is still very immature and not many pre-built components exist for it, so this is more for people who don't mind getting their fingers dirty. Regarding support for v0, we haven't abandoned you! We'll continue to answer support queries for old versions, each time with a short note explaining that you're using a deprecated release. We appreciate your choice of famous-views and care about your existing projects. Please just understand that priority will be given towards development and support of the new version. However, once 1.x is mature and the mixed-mode ecosystem well developed, we will at some point need to end old support entirely. We had a good run! 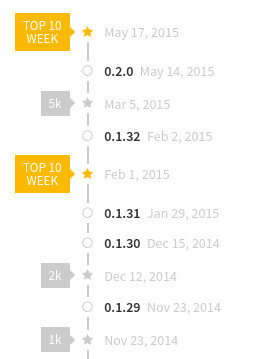 As of time of writing, famous-views had 8,469 downloads and 82 stars on Atmosphere, and 309 stars on GitHub. A massive thanks to all our users and contributors, who helped get us here, and continue to push us forwards. Thanks buddy for all the sweat and time you invested in making famous accessible to meteor folks, I look forward to assisting in whatever capacity I can to get the new series ready for production.